There have been news that investors are shunning stocks. Moreover, many analysts talk about the death of equities. However, the analysis of Sam Mamudi from Marketwatch shows that it is not the stock market investors are fleeing. They rather ditch actively managed US stock mutual funds and invest their money into passively managed equity index funds. Since 2005 money has been flowing out of the active equity funds totaling 369 billion USD. On the other hand, there has been an inflow of savings into passive equity funds (without the ETFs) for the same period totaling 112 billion USD according to the Investment Company Institute, an association of US investment companies. From the beginning of this year through the end of July active funds saw net outflows of 29.5 billion USD. Over the same period, passive funds saw net inflows of 28.8 billion USD according to the analytic company Lipper. Naturally, these numbers pale by comparison to net infows into bond funds which amount to 180 billion USD over the same period. In my opinion this money flows show certain transition in the heads of investors towards passively managed index funds. Still more investors are becoming aware of the fact that active managers are not able to consistently beat the market. This is mainly due to the high costs of active management. 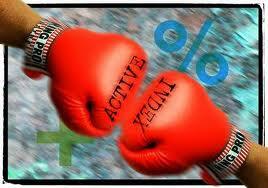 Investors would be better off having their money in a diversified portfolio of index funds. Martin Kollár pridal tento článok v kategórii Passive investing	on Sunday, September 5th, 2010 at 18:15. Komentáre k tomuto článku môžete sledovať cez RSS. Môžete pridať komentár alebo trackback z Vašej stránky.